Joseph Solomon accepts his prize. Saturday 10 December saw a feast of drumming as 17-year-old Joseph Solomon from London won the Live Grand Final of #FUTUREBEAT, the UK's groundbreaking and most prestigious new national live drumming competition. This was introduced by Yamaha for drummers aged 18 years and under, and partnered by Rhythm magazine and MusicRadar. Currently studying Music at The Brit School, #FUTUREBEAT winner Joseph Solomon from Lewisham began playing drums aged 5 and has pursued his dream to become a professional drummer since the age of 14. Joseph's career highlight so far is playing to 50,000 at The Excel Exhibition Centre (Festival of Life). Initially self-taught, Joseph's mentors comprise Michael Afuape and Laykay Dada, and he cites drummers Jon Onabowu, Morgan Simpson and Alvin Muchina among his influences. Selected from over 200 entries, 50 regional finalists had the chance to compete for places in the live Grand Final, where each Grand Finalist performed sections solo, with accompaniment to track, and in a 3-piece live band with Yamaha artists Andy Jones (Van Morrison, Cliff Richard, James Ingram) on guitar and bassist Jon Noyce (Jethro Tull, Gary Moore). Judging criteria included groove, timing, technique, versatility and expression. 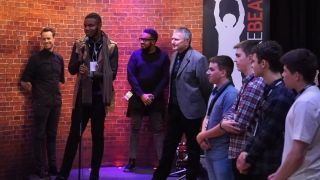 Prior to their performances, all six Grand Finalists benefitted from an intense morning of one-to-one mentorship sessions with the live band and each member of the distinguished judging panel, which comprised Yamaha Drum Artists Troy Miller (Amy Winehouse, Laura Mvula, Roachford), Steve White (Paul Weller, The Who, Ian Dury, Jon Lord) and Donavan Hepburn (Take That, Adele, E.L.O). Donavan also judged at the Regional Final stage, along with Mikey Sorbello and Ian Palmer. Taking centre stage in the stunning new live room at Yamaha's UK headquarters in Milton Keynes, #FUTUREBEAT Grand Finalists Joseph Solomon (17), Ollie Woods (16), Jordan Farrugia (17), Rory Millington (17), Matthew James Mackellar (18) and George Farrar (18) treated the judges and invited audience of industry and media to some truly outstanding drumming, leaving the judges with the unenviable task to choose a winner. Announcing their unanimous decision, Steve White said, "#FUTUREBEAT has demonstrated what great condition the future of British drumming is in and the value of Yamaha's support and advice to help young drummers achieve their dreams." Donavan Hepburn commented, "Judging this competition was a great privilege and the hardest job with the standard so high. Today was an opportunity to look at the future and see the huge potential of the next generation of drummers coming after us." Troy Miller added, "It was really encouraging to hear all the performances and invigorating to watch the enthusiasm and preparation. I was bowled over by the level." Besides the much coveted title of '#FUTUREBEAT Winner', Joseph Solomon was awarded a Yamaha Live Custom Drum Kit. Courtesy of Yamaha, all Grand Finalists who made it through from the regional finals received a Yamaha RC Series snare drum, and all regional finalists a Yamaha drum pedal. A delighted Joseph Solomon said, "My future aspiration is to inspire other young musicians, who are wanting to be successful in their career. FUTUREBEAT has been a great platform and form of support to myself and to the other finalists. It allowed me to showcase my abilities to my fullest potential. It is also a great platform for any young musician looking to establish themselves in the music industry." During the Grand Final, the judges interviewed the Grand Finalists and all described the day as one of their best experiences, especially referring to the mentoring sessions and opportunity to play with the live band. #FUTUREBEAT was championed at the outset by Yamaha Drum Artist George Daniel, drummer for chart-topping rock band The 1975, who described the competition as, "a great platform for young drummers that provides a level playing field for showcasing new talent." The widespread acclaim for the competition has included a wealth of positive feedback from audiences at the regional heats and the drum dealers who hosted them at Absolute Music - Bournemouth, PMT Birmingham, Drummers Only - Glasgow, Drumshop - Newcastle and Manchester Drum Centre. It's a response that affirms Yamaha's vision to launch #FUTUREBEAT and reinforces the value of Yamaha's commitment to excellence in drum education and a progressive outreach approach by the company's Pro Music Division to promote playing drums and provide meaningful support to drum teachers in the community, as well as over 20 Yamaha Music Point locations teaching Yamaha's Drum Encounters course.